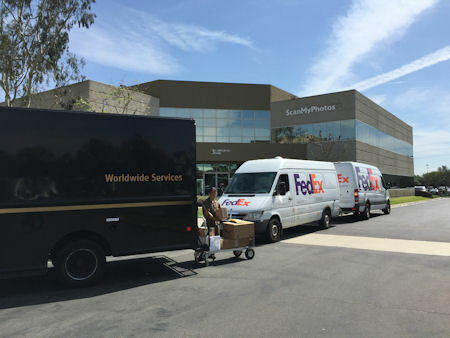 Irvine, CA – ScanMyPhotos.com joins innovative marketing veterans such as PepsiCo Soft Drinks, General Motors and FedEx; all have chosen not to take out expensive Super Bowl ads. In the case of ScanMyPhotos.com, the international online photo imaging and scanning company will instead concentrate on connecting direc tly with potential customers through social media channels. ScanMyPhotos.com announced it would not premiere any television spots during either Super Bowl XLIV, which airs on CBS Sunday, Feb. 7 from Miami, or the Winter Olympic Games. NBC’s broadcast of the 2010 Olympics in Vancouver begins on February 12. Since the retail and online photo imaging company’s approach is super affordable prices, there simply is no media budget available to position the ScanMyPhotos.com message and build its brand for super-fast photo scanning during these two mega-events. "While it is every entrepreneur’s dream to leverage its brand and get in front of the massive Super Bowl and Olympic Games’ audiences, we simply can't afford to shift our strategy from super affordable photo scanning to invest in these leading sporting events. By not spending millions of dollars on these ads, we are able to retain our price of $64 to scan 1,000 photos and our most popular fill-the-box prepaid scanning service [includes free S&H to scan upwards of 2,000 photos for just $149.95]. We don’t want to pass the bill onto our customers. Instead of television commercials, ScanMyPhotos.com will use social media sites to engage the nation’s picture-takers. We will continue using and Blogger to provide photo deals and photo tips [http://www.Twitter.com/ScanMyPhotos, http://blog.ScanMyPhotos.com]. The savings by not advertising on the Super Bowl and Winter Olympics are returned to our customers through transparent and super-low prices," explained Mitch Goldstone, president & CEO, ScanMyPhotos.com. A menu of hundred’s of photo imaging services are featured on the ScanMyPhotos.com Web site, including photo, slide and negative scanning, Kodak-quality photo reprints, photo greeting cards, custom picture memory albums, Kodak Picture Movie DVDs and photo restoration services. ScanMyPhotos.com is a well-known leader in the photo imaging industry. Founded in 1990, ScanMyPhotos.com trusts Kodak technology to professionally scan tens of millions of images to enable families to save and share generations of photo memories. A New York Times article said that "ScanMyPhotos.com service could turn out to be the best [$64] plus shipping you'll ever spend." Click here to join in the adventure. Use access code: "vegas2009" to view video. How ScanMyPhotos.com takes care of its employees at the SkyLofts Suites at the MGM Grand in Las Vegas during one of our regular company adventures. Very nice and immediate letter from The American Red Cross we just received upon receiving our donation from ScanMyPhotos.com for Haiti Relief. Red Cross in response to the earthquakes that devastated Haiti on January 12, 2010. Your gift makes it possible for the Red Cross to provide comfort and hope to disaster victims across the affected region, helping to meet critical needs such as for shelter, food, relief supplies and other emergency assistance. around the world. We speed relief to disaster survivors and help communities to prepare for the next emergency. We lead programs to prevent deadly diseases such as measles, malaria and HIV/AIDS. We reconnect families separated by crisis or conflict, and promote understanding of the global humanitarian principles that guide our work. Each year, the American Red Cross and our Red Cross and Red Crescent partners worldwide improve the lives of millions of people. Please continue to visit us at http://www.redcross.org/ for the most current disaster updates and information about our programs worldwide. Your generous support means the most to the people who rely on the Red Cross to help them through some of the most difficult times of their lives. Our work can only be accomplished because of compassionate donors like you. An implementation of OLE (object linking and embedding) developed by Microsoft that allows the user to see desktop applications in a web browser. A type of compression software commonly used to back up files. The method of compression changes with the type of file and is not recommended for photographic images because it may destroy the original data. The maximum resolution of any device. The finite number of pixels that any imaging device is capable of creating, manipulating, or imaging. Adobe’s software application for creation and viewing of Portable Document Format (PDF) files that can display a document as it was originally designed without having the particular software or fonts used to create the file. An electronic signal, tone, or other measure that is continuously variable in its level as opposed to the discrete steps or levels of digital data. An inexpensive local-area network (LAN) architecture that is built into all Apple Macintosh computers and printers. Apple- Talk supports Apple’s "LocalTalk" cabling system as well as Ethernet and IBM Token Ring. It can connect Macintosh computers and printers, as well as PCs that are equipped with special AppleTalk hardware and software. In digital graphics applications, unwanted visual anomalies or defects generated by an input or output device or software operation that degrades image quality. One of a small group of prints set aside from the edition for the artist’s use. Sometimes a number of printer’s proofs are done for the printer’s use. A high-capacity network connecting subnetworks. Running applications behind others in a multi-tasking computing environment. The overall performance may be reduced due to the multiple allocation of computer resources. Patterned stripes on a print that create harsh, well-defined transitions between different ranges. Generally caused by insufficient color or gray-scale ranges within the output device’s image processor, or by insufficient information contained within the original scan. The capacity a network or data connection has for carrying data. For analog transmission, bandwidth is the range between the upper and lower transmission frequencies in a given range. It is measured in cycles per second or hertz (Hz). For digital transmission, bandwidth is measured in bits per second (bps), and the larger the bandwidth number, the faster the digital transmission. The Photo CD image resolution (512 x 768 pixels) that is formatted for display on current consumer televisions. The 1,536 x 1,024 pixel image that is scanned and stored on a Photo CD. The 2,048 x 3,072 pixel image that is scanned and stored on a Photo CD. The maximum resolution image file that is available on Pro Photo CDs. This 4,000 x 6,000 pixel image produces a 72 MB file. A specific type of image capture sensor or CCD that can capture high-quality digital images with a single chip. Basic Input Output System (BIOS) A file that defines system control for a computer and facilitates the existing input and output connections between the keyboard, monitor, and other devices. A method that allows for the repetitive processing groups of data or several digital files by executing only one command. The number of voltage or frequency changes made per second on a communication line measured in bits per second (bps). A bit is a binary digit. This is the smallest piece of binary information used by a computer. The maximum number of bits that are used to define a pixel, a measure of the defined brightness range, the color depth or pixel values for a digital image, or the number of possible colors or shades of gray that can be included in an image. A rasterized graphic image formed by a rectangular grid of pixels or dots. A measurement of data transmission speeds. As the name implies, bps is the number of bits that pass a certain point in one second. Printing term referring to an image or inked area that extends beyond the trimmed edge of the page. A visual effect caused by overexposing an image sensor to too much light resulting in a leakage into adjacent photo sites. This "digital overexposure" can cause distortions of the subject and/ or color. The overall intensity of an image. The lower the brightness value, the darker the image; the higher the value, the lighter the image. See Chroma. A device that allows the connection to a network over the coaxial cable of a cable television network. Cable modem speeds can range from 500 Kbps to 10 Mbps. A bank of high-speed memory set aside for frequently accessed data. The application of computers in the design process. A strip of color/tonal values used to check quality on a negative, proof, or printed piece. Digitally acquiring image information with a device such as a scanner or digital camera. The container for inks in inkjet printers. "Chipped" cartridges have electronic chips on them that can prevent refilling. "Unchipped" cartridges can be reused, or used with inks other than those of the manufacturer. A light-sensitive device that collects electrical charges in a potential well proportional to the incident light. The charge is then read out digitally. The original standards for compact audio discs now refer to any 4.75-inch optical disc, which can store data in various forms. A CD-ROM format that holds audio, MPEG video, digital data and still graphics allowing a user to interact with the content on the disc by use of a mouse or other pointing device. A format that allows CD writers to record data to a blank CDROM disc. A storage medium using CDs to hold computer data. A CD can hold about 650 MB of data, or about 300,000 pages of text. A positive film image; multimedia technology of Microsoft that acts as an interface to DirectX, using a set of XML tags. A network in which the processing responsibilities are split between the server and the client. Copying pixels of data to new spatial locations in an image; computing systems based upon IBM design using Windows operating systems. The three primary colors of the subtractive color model, used in color printing. In theory, the combination of pure CMY inks produces black; in reality, black must be added to produce a full color gamut. Cyan, Magenta, Yellow, and Black (or Key) are the four colors used in process-color printing. The process of treating a media or substrate to accept inkjet inks. Also, a thin covering that provides protection from UVinduced fading, smudging and fingerprints, which may or may not improve the permanence of the print because most fading is due to visible light. Visual perception created when light of varying wavelengths in the region of approximately 400-700 nm is detected by the receptors of the eye and processed by the brain. The ability to reproduce all of the colors in a scene within an acceptable standard. Software and/or hardware that adjusts and coordinates colors between two or more digital devices. Color calibration systems commonly compare device color profiles and translate one color model into a device-independent language. An unwanted tint of one color in an image. This can occur due to an input or output device, or lighting conditions. Shrinking the color gamut of an original to the color gamut a device can represent or reproduce. The process of adjusting an image to correct for color imbalances or for the characteristics of the chosen output device. A graphic mechanism for displaying color measurements and for making color changes to an image. User adjustments to the angle and slope of the curve implement color changes to one or all of an image’s color channels. The process that helps overcome variations in color reproduction workflows by creating data files that describe the unique characteristics of individual digital devices. The result enables color matching between devices, including from monitor to print, between an original photograph and a digital file, and even between two prints created on different media with different inks. The four stages of color management are consistency, calibration, characterization and conversion. See Profile. A combination of software and/or hardware devices used to produce accurate color results throughout a digital-imaging system. A three-dimensional mathematical model that includes all possible colors. The parts of the visible spectrum that can be reproduced, such as RGB for computer monitors, CMYK for print and web safe index colors for the Web. A scale used to refer to the visible energy system of various light sources. The scale uses degrees Kelvin as a measure of the mixture on a scale from red to blue-white. Daylight = 5,500 Kelvin, a blue-white color. The tungsten in a light bulb produces approximately a 3,200 Kelvin, an orange color. The amounts of three primary stimuli required to match equal radiant power at each wavelength. A non-volatile type of storage media using flash memory technology (see Flash Memory) that is used with some makes of igital cameras and portable computer devices. The process of removing irrelevant information and reducing unneeded space from a file in order to make the file smaller. Compression can cause losses and distortion, depending on the method. The two types of compression schemes are lossy and lossless. Ensuring the device in a color workflow, such as a monitor, scanner or printer is able to reproduce color consistently. The first step in the color management process. See Color Management. An image that consists of a visually infinite tonal range of colors or gray values. Value changes appear as a continuous gradient. For printing purposes, continuous-tone images are converted to dot patterns (halftones). Tonal gradation between the highlights, midtones, and shadows an an image. High contrast implies dark black and bright white. Medium contrast implies a good spread from black to white, and low contrast implies a narrow spread of values from black to white. Text, graphics, pictures, sound or video or other information stored and arranged in an orderly manner. of fields, records or files from a database. The process by which the full data content of a compressed file is restored. Delta-E is used to describe (mathematically) the distance between two colors. To calculate the Delta-E of any two colors, you need to know their LAB values. Once you have these values, all that you need to do to calculate Delta-E is to calculate the distance between the two points in the LAB color space. An instrument used to measure the optical density of a transmitting material, or the negative log of the reflectance of a reflecting material. They do not measure color, but rather indicate the percentage of a given area that is covered by halftone dots in density units or percentage dots. Densitometers are widely used in the graphic arts and photographic industries to ensure consistency and for process control. See Density. The degree of opacity of an image; a measure of reflectance or transmittance equal to log10 (1/reflectance) of log10 or (1/transmittance); he ability of a material to absorb light - the darker it is, the higher the density. Density measurements of solid ink patches are used to control ink on paper. See Densitometer. A color space that is unique to a specific device and its colorrendering capabilities. Mathematical equations or look-up tables used to transform from a common color space to the specific color space of a device. Color specifications that are based on an independent color model rather than the gamut of an output device. A single character in a data system. Type of data consisting of (or systems employing) discrete steps or levels, as opposed to continuously variable analog data. A recording format that stores data in digital form on magnetic tape. DATs are used for backup and archival storage but are too slow in access time for normal operating purposes. Any camera system that is capable of capturing image data into a digital file. Any of a number of printing devices that expose photographic paper to LED, laser, or CRT light sources using a digital data input and pixel-by-pixel exposure. Any device that is capable of translating digital data into hardcopy output. Typically refers to one of the digital output technologies, such as inkjet, electrostatic, thermal transfer, or laser photoprinting. A special chip created for high-speed data transmission and manipulation particularly in communications, graphics, and audio-intensive applications. A device that converts digital data into analog signals so the data can be retrieved from a digital device. Convert analog signals or images to digital values. The ability to transfer data from a storage device to memory without going through the processor. The printing process that allows for the elimination of film separations from the printing process. The term is short for electronic commerce, conducting business or transactions over the Internet. The final appearance of a scan that has been enhanced to produce more data than the scanner can record. This is done by interpolation. A display mode defined by 640 x 350 pixel resolution and 16 colors. A hard drive controller with 32-bit transactions and in some cases direct memory access. Each pixel has eight bits assigned to it, providing 256 colors or shades of gray. A grayscale image is an example of 8-bit color. EPROM (Erasable Programmable Read-Only Memory) A storage device that uses electric charges stored in an isolated MOS transistor to simulate data that can be stored for as long as 10 years, can be programmed, and erased. A graphic file format used to describe an image in the PostScript page description language denoted by file extension .eps. A printing technology that uses random dot placement to achieve optimal results. A standard for data communications and networking that allows for transfer rates up to 100 Mbps using coaxial, fiber-optic, or cabling similar to telephone line. An IBM standard display mode providing 1,024 x 768 pixels of spatial resolution and 256 colors. A subset of SGML whose objective is to enable SGML to be served, received, and processed on the Web just as HTML. The particular arrangement of digital information that is saved from an application program for a specific use. The processing transforms used in some scanner systems to compensate for different film characteristics. A device used to record digital images onto photographic film. Functions found in most image-editing applications that use algorithms to modify digital images by changing the values or arrangement of specific image areas. A security system that prevents unauthorized access to resources or information on a network from being passed on to another network. A high-performance serial bus standard developed by Apple and Texas Instruments that includes transmission speed scaleable from 100 to 400 Mbps, is a hot swappable connection, and allows for up to 63 devices to be connected at once. FireWire is Apple’s version of the IEEE 1394 standard. Software programs stored in a computer’s read-only-memory (ROM) that are permanent and cannot be changed. Such programs re associated with functions like the boot-up process. software technology that allows the user to edit very large image files in near real-time by accessing only the image data being edited. A file format used for the delivery of vector graphics and sound over the Internet. An EPROM module that has fast access and can be erased. An image file format developed and supported by Eastman Kodak, Microsoft, Hewlett-Packard and other companies. This format uses FITS (see FITS) technology to facilitate the transmission and manipulation of large image files. Any given typeface containing all of the numbers, letters and symbols. A printer’s print area, or a media/graphic’s width. "Medium format" is generally 11 to 24 inches in width, "large (wide) format" is generally larger than 24 inches in width; and "grand format" is usually larger than 72 inches in width. The use of cyan, magenta, yellow, and black dots to simulate a wide variety of colors. A client-server protocol that allows file transfer over a TCP/IP network. A printing term used when an image or inked area extends beyond the edge of all four sides of the printed piece. A measure of the amount of contrast found in an image according to the slope of a gradation curve. High contrast (steep curve) has high gamma and low contrast (shallow curve) has low gamma. The nonlinear tonal correction editing of an image’s gamma curve. This is typically used to manipulate image shadow detail and lighten the image without washing out the highlight areas. The process of removing areas of overlapping cyan, magenta, and yellow inks and replacing that amount with black ink in the black separation. Compare to UCR. The loss of image quality or data as the image is reproduced multiple times. The effect of changing an object’s level of opacity in imageediting software. A unit of memory or file size that equals 1,024 megabytes. A color correction in a digital image that affects the entire image. A video signal that will resolve 1,125 lines in the USA and be capable of receiving digital video broadcasts instead of the current analog broadcasts with the current analog NTSC signal. A unit used to measure the number of waveforms per second. An infrared cutoff filter that is placed in front of CCD chips to remove the infrared radiation to which the chips are sensitive. Standards for input and output devices (i.e., USB) that allow computers to automatically recognize them without rebooting. A graphics language used by HP printing devices for printing and storing graphics files. A color model in which numerical values describe hue, saturation, and brightness. A computer language using a standard group of tags to tell a Web browser how to display text and graphics. HTTP (Hyper Text Transfer Protocol) The standards that let users of the Web transfer information in web pages. A device that connects two or more devices so they may communicate. A group of companies in agreement that develop standards defining color and reproduction characteristics of hardware/ software devices and media independent of device-specific characteristics. The processing of an image to improve elements such as color, tonal range, and defects. See http://www.scanmyphotos.com custom Photo Restoration services. A 5- or 6-resolution Photo CD file stored in YCC format. Any operation that can be performed on digital data to alter its characteristics and thereby the image that it represents. The ability of a software application to bring in files that are not in its native file format. The process of positioning pages of a publication into the correct position to ensure proper page order after printing and binding. A subset of colors of a specific color system that defines the palette used in a specific image. The building blocks of computer hardware in which transistors are combined to perform a particular function or series of functions on one computer chip. A communication link in a computer between hardware, software, and the operator. A technique used in compressing motion images that uses similarities between an image frame and a previous reference frame. A video signal in which two fields, odd-numbered lines followed by even-numbered lines, are interleaved that is common to the NTSC standard. A set of interconnected networks that forms a global TCP/IP network. The encryption of IP packets in an Internet protocol network. It is most suited for a private network not connected to the Internet. An organization that sells access to the Internet. A process for increasing image size by using nearby pixels to estimate the color for pixels in the new, larger image; any process used to estimate color. An internal network using the TCP/IP standard allowing the sharing of resources such as printers, files, and storage space on a server. The address of a computer on a TCP/IP network written as four groups of up to three digits separated by periods, e.g., 121.119.115.11. A representation of the light sensitivity of an image sensor. The higher the number, the higher the sensitivity to light. Noise may increase as ISO increases. Any storage medium that uses variations in magnetic polarity to record information. Scans from 35mm transparencies or negatives produced in the Eastman Kodak PIW 2200 or 1200 workstation. Images are written to Kodak-branded media. A special effect that can modify images so that only part of the image can be seen, or so that the image blends into the background. Traditionally, the plate or surface upon which an image is inscribed in order to hold ink before transferring the image to a substrate or paper. In digital terms, the matrix becomes the electronic file located on a computer’s hard drive or stored on a disk or CD. This matrix is made up of binary encoded information that can describe how the image file should appear on the digital raster screen or print. A low-gloss finish with very little reflective quality. ScanMyPhotos.com specializes in Kodak professional Endura matte finish photographic printing. A measure of data equal to 1,048,576 bits. A measure of data equal to 1,048,576 bytes. The material to be printed on, such as watercolor papers, canvas, copper, wood veneer, cotton, or plastic. Media and substrate are the most common terms used in digital printing. A type of storage media developed by Sony used in some digital cameras and portable computer devices. A file format that contains both bitmap and vector data that can be used on different machines and in different applications. The phenomenon that describes the visual match of two or more spectrally different colors under certain viewing conditions but not in all viewing conditions. A tonal, rather than linear, engraving process. First, the surface of the plate is roughened with a mesh of small burred dots, then the picture is produced by flattening and burnishing selected areas that print as highlights. Mezzotint is making a comeback as a printmaking technique. The technology used to convert scanned text on printed pages into editable ASCII text. A standard for transferring data between databases. Currently the most common commercial printing method where ink is offset from the printing plate to a rubber roller, then to paper. A standard that provides a software channel for inserting an object into a document that still has a link to its original application. Lacking transparency or translucence. The measure of the amount of light that can pass through a material. The property of a film that prevents "show through" of dark printing or marks on a substrate (media). The degree to which a material obscures a substrate, as opposed to transparency, which is the degree to which a material does not obscure a substrate. A disc on which digital data may be read with reflected laser light that bounces off the surface of the disc. Optical Resolution The maximum physical resolution of a device. provides better image quality than interpolated resolution that uses software to create additional image information. The direction that the page is printed; horizontal = landscape, vertical = portrait. OSI (Open System Interconnection) A network model in which peer-to-peer communication is divided into seven layers. In digital printing technology, to translate information from the computer to an external device, such as a printer or monitor, to print. Also, the visual display of digital information. The range of color or tone available in the imaging process, or a movable menu of tools or options found in software applications. The computer interface that uses a data transmission scheme over wires connected in parallel and is usually found between a computer and a peripheral, most commonly a printer. A storage device with a 68-pin connector containing two rows of 34 pins, used in digital cameras and notebook computers. A Proprietary file format used with the Eastman Kodak Photo CD system. A 32-bit local bus standard that supports up to 16 physical slots used to connect peripheral devices to a computer. A page description language used by Hewlett-Packard for its inkjet and laser printers. A document type created by the Adobe Acrobat Software Application to provide a cross-platform method to transfer information. Text, graphics or PostScript files are converted to PDF format that can be opened on any computer system with the free Adobe Acrobat PDF Reader. A programming language used to control the formatting and layout of a printed page, e.g., PCL and PDF. Any external device that may be connected to a computer. An inkjet printer where the ink starts as a solid but is then heated, liquefied, and sprayed onto a substrate. A trademarked Eastman Kodak-designed storage system for photographic images using CD as media. A color standard established by Eastman Kodak that is used to define the color space for digital imaging in Photo CD and desktop publishing. A unit of measurement used in the graphic arts industry that equals approximately 1/6 inch. A graphic file format used by Apple computers. A type of colorant consisting of particles made up of many synthetic dye molecules or carbon black; generally more stable than dyes of the same color. Pigmented inkjet inks are credited with better longevity and may have a narrower color gamut. The distortion of an image that occurs when the center of the image compresses toward the center, most noticed at the center of the horizontal and vertical edges. The smallest element of a raster image where brightness or color values have been measured. Derived from pi(x)cture element. The amount of data used to describe each colored dot on a computer screen. For example, monochrome is 1 bit deep, grayscale is 8 bits deep, RGB is 24 bits deep. Images to be printed as CMYK separation should be 32 bits deep. In printmaking, a surface that has ink on its flat plane as opposed to being engraved or embossed to hold ink. The glass surface of a flatbed scanner on which reflective art is placed for scanning. The ability of an operating system to identify and configure the system to incorporate peripherals. A scheme for representing 3,000 distinct colors by means of a numbering system. A light-sensing device usually found in drum scanners. These vacuum tubes are much more sensitive to light than CCD chips. The orientation of an image that is taller than it is wide. A setting controlling an output device to properly fit a computer document to the print medium. Vertical. Clear material applied as a final coat to protect prints or artwork. The conversion of an image to a more elementary form by reducing the number of tonal values, creating a surrealistic, stark result. A standard page description language in desktop publishing that describes the appearance of text, graphical shapes, and images as printed or displayed pages in a device-independent way. A measure of the amount of image information density. The visually perceivable and measurable absorption of light on the surface of a medium due to the presence of a colorant. OD only measures the surface density of a dry hard copy, not the density of the total amount of ink that was sprayed onto the medium. A commercial, digital printing agency or firm that takes an artist’s image file and prints it to the artist’s specifications. Printer-specific software that allows a computer to communicate with the printer. See RIP. Photo CD images scanned on the Eastman Kodak 4045 or 4050 scanner, allowing for an optional Base x64. A mathematical equation used to transform from one color space to another color space in order to more accurately match the output of devices. In digital printing, generally used to refer to a color profile, especially of a specific piece of equipment (monitor, printer, scanner, etc.) that enables the user to correlate color consistently on various devices. See Color Management. A prototype that shows the printer and customer what the job will look like after printing, so any necessary changes can be made before the job goes to press. A standard procedure or a set of procedures with which software and hardware systems must comply in order to be compatible. A more fault-tolerant disk storage technique that spreads one file over several disk drives. If any drive fails, the data can be reconstructed from data on the remaining files. The standard type of memory in central processing units (CPU) of computers in which data is stored and accessed randomly enhancing storage and access time. An image composed of lines of pixels in a grid layout or bitmap. The conversion of vector image information to raster image information. A term used for photographic paper used in most color and some black-and-white printing applications that has a polyethylene coating on each side. A chemical layer adhered to a surface that receives and binds the ink from the printhead nozzle. The measure of light that is reflected off a surface; varies according to the wavelength distribution of the light. Reflectance, Specular Mirror-like reflectance. The magnitude of the specular reflectance on glossy materials depends on the angle and on the scattering of the light by an uneven surface. Reflectance of radiant flux reflected at all angles from the surface, thus including both diffuse and specular reflectances. A term that refers to any physical image, be it original art, photo, or printed piece, that reflects light when viewed. Guide lines on the sides of each layer of a CMYK separation to ensure proper registration or alignment. A database that stores data across multiple tables of files that are related by common information in each of the tables of files. In printmaking, a process using printing plates that are incised, etched, or sandblasted before the surface is inked. Lines or areas that have been cut away do not print. The ink is transferred from the surface of the plate to the paper either by hand-rubbing or with a press. A storage device that can be removed and inserted into any similar playback device. The use of images, text, or information stored in documents for purposes other than its original intent. A term used to define image resolution in pixels per millimeter; e.g., Res 12 is 12 pixels per millimeter. Multiplying Res by 25.4 results in the equivalent resolution in dots per inch (dpi). Changing the resolution of a bitmap without changing the file size. The amount of detail in spatial or color variation that can be identified in an image. Refers to the number of smallest discernable dots or pixels. The manual or digital process of removing imperfections or unwanted portions of an image. A color model composed of the primary additive colors of light. These colors can be mixed to obtain all other colors. A file format used to store grayscale images. "Bridge" software that allows a computer to give specific instructions to a printer. Often includes add-on features such as color-calibration routines and various tools for a color-managed workflow. A microprocessor architecture that processes a small set of instructions rapidly. RISC is found in Power PC and other types of computer systems. A method of compressing image data that encodes the brightness or color values of adjacent pixels that have the same value with a single value for the brightness or color information and a run-length equal to the number of adjacent pixels that have this value. A type of memory that can be read but not altered in any way. The pattern created in a printed image when color halftone screens are placed at conventional screen angles. A network interconnection device and associated software that links two networks. A primary way in which analog information is digitized by measuring the analog information periodically. The purity of a color; the amount of the gray component of a color. More saturated colors are more pure with a lesser gray component and less saturated colors contain more gray. To enlarge or reduce an image by increasing or decreasing the number of scanned pixels or the sampling rate, relative to the number of samples per inch needed by the printer or other output device. See Interpolation. A process used to produce halftone dots. A sequence of commands that a computer executes at the touch of a button (a macro). A standard for parallel interfaces that can transfer data up to 80 MBps and in which up to 7 peripheral devices can be attached to a single port. The secure digital memory card about the size of a postage stamp used in digital cameras and portable computing devices to store personal data in a secure format. A standard for color television in parts of Europe and Asia with 625 line resolution. The control computer on a local area network (LAN). The server controls software, access to printers, and other parts of the network. The universal standard specifying formatting features for text documents to be displayed and transmitted over the Internet. XML documents and HTML documents are applications of the SGML standard. The darkest parts of an image. Subtle features in the darker part of an image. The darkest tone printable in an image without being black. All tonal values below this threshold will print as black with no detail. Occurs when ink penetrates the paper substrate and is visible from the back; also termed "print-through." A masking or image blocking that isolates an image from the background. A form of small-format (35mm or 6cm) camera that has a reflecting mirror that retracts when the shutter is released. An SLR allows the photographer to view the image exactly as it will be framed in the photo. The storage media used in some digital cameras and portable computer devices. Viewing a digital image with a monitor instead of generating a hard-copy proof. Can be done from a remote location via the Internet. The smallest feature of an image that can be detected as a fraction of the total image. as well as ICC profiling. The spatial arrangement of components of radiant energy in order of their wavelengths, wave number, or frequency. In this context, the full range of visible wavelengths of light energy radiation. The small highlight area of an image that contains little to no detail. A widely used programming language for defining, modifying, and accessing information in relational databases. SQL allows queries to be made from other programs. A type of memory used in a cache that preserves information as long as power keeps the device running. One of several standard RGB color working spaces. Best used for images on the Internet. A tool that is used on a graphic input tablet as a drawing instrument, or as a mouse. Scanning at a less-than-optimum sampling rate. The color-mixing system associated with pigments, as opposed to pure light. Also, a color model that works by removing selected colors of light that are reflected off, or transmitted through them. The term refers to the CMYK color space used by conventional and digital printing devices to produce fullcolor printing. See CMY. The three colors (Cyan, Magenta, and Yellow) that are used to create all other colors in color photographic printing. A video standard that allows for resolution of up to 800 x 600 pixels. The standards that define the color and dot gain characteristics of a web press. Premier blog for everything you need to know about photo, slide and negative scanning. ScanMyPhotos.com digitally preserves your photo memories with worldwide service. Visit often for regular updates, tips and stories from our photo scanning, photo restoration and online digital imaging headquarters. Keep watching ScanMyPhotos.com and our online and retail photo imaging services for regular updates. A high-speed data transmission circuit with a transmission rate of 44.76 Mbps. The standard for Internet communications that determines how packets of information are sent and addressed over the Internet. IP is packet addressing method and TCP checks, tracks, and corrects transmission errors. Terminal emulator that allows a user to connect to a remote computer through the use of the Internet. A measure of file size or memory equal to 1,024 gigabytes. Printer using inkjet print heads with a heat (thermal) system used to produce the ink drop. A machine that digitally prints by transferring inks (resin- or wax-based) from a foil or ribbon onto media such as paper or vinyl. A small version of a larger graphic image used for indexing databases of images or to preview a very large image. A platform independent image file format specifically designed for bitmapped images. The process of breaking down an image into sections for editing or printing purposes. A curve describing the relationship between the input values and output values for brightness or color that can be used to adjust the contrast of the image. The mathematical conversion from one color space to another; i.e., RGB to CMYK. A prepress technique that allows for slight variations in registration during the press run. A scanning device that uses three linear array charge-coupled devices (CCDs) utilizing red, green, and blue filters to capture color scans in a single pass. A digital color model that uses eight bits of each of the three additive colors (Red, Green and Blue), and can reproduce 256 shades of each. Each pixel has 24 bits assigned to it, representing 16.7 million colors. Eight bits - or one byte - is assigned to each of the red, green, and blue components of a pixel. Also known as 24-bit color. The software interface that allows graphics software to capture bitmap images from a scanner or digital camera. The process of eliminating equal amounts of yellow, magenta, and cyan from the neutral shadow areas and replacing them with black ink in the black separation. Compare to GCR. Radiant energy with wavelengths slightly shorter than the visible spectrum. A multi-user, multitasking operating system written in the C language and designed for both mainframes and minicomputers. To send a file to a networked host or to another machine. An acrylic sheet used in framing art that has ultraviolet light inhibitors capable of filtering out 99 percent of UV rays (one of the causes of print fading). The resistance of something to change under UV light sources, including daylight. A digital printing application in which documents can be customized during the printing process using data from a database of images or text. A full motion digital video format on CD-ROM using MPEG- 1 video compression and incorporating a program control bar with controls similar to those of a VCR. An image represented by mathematically defined shapes, such as lines, polygons, text, and groups of objects as opposed to bitmaps of them. A display standard providing 640 x 480 resolution with 16 colors. A type of hard-drive space that mimics actual memory (RAM). A computer-generated 3-D environment in which users interact with the environment and objects in it through the use of specialized input devices such as goggles, headphones, and gloves. A malicious program designed to destroy data or halt operations on computer systems. A special type of RAM that can perform reads and writes at the same time, allowing it to send information to the monitor at the same time it receives new information from the video processor. A programming language that supports animation of virtual spaces on web pages. A faint background image on a printed piece or included in digital files as a security feature (such as on printed currency r checks) or to denote a copyright of an image. An identifying mark or symbol imbedded in the substrate on which the art is made, usually referring to the maker of the substrate. A sound file format used for storage and transmission of audio files denoted by the file extension .wav. A high-speed printing press that prints on both sides of a continuous roll of paper. Web presses are used for high-volume printing such as newspapers and magazines. The balancing of color components to create pure white when photographing or scanning a white object. A substitute for a color temperature setting. A network that covers a wide geographical area and usually operates at speeds lower than local area network (LAN) speeds. Write once, read many. A storage device that can have data written to it once and read many times. The data cannot be overwritten. A removable storage device, approximately the size of a 3.5- inch disk that holds 100 or 250 MB of data. A peripheral device that reads and writes to the proprietary Zip Disk storage medium. The magnification of one part of an image. You can make a donation by calling 1-800-REDCROSS or 1-800-257-7575 (Spanish) or click on the Donate Now button. www.redcross.org or by calling 1-800-REDCROSS (1-800-733-2767). The public can also help by texting “Haiti” to 90999 to send a $10 donation to the Red Cross, through an effort backed by the U.S. State Department. Funds will go to support American Red Cross relief efforts in Haiti. Never mind the run of the mill questions about who designed their outfits and what fragrances they're wearing. Kodak is more interested in memorable moments, "the times of our lives" and what makes people smile. So as part of a multi-faceted brand integration that placed Kodak HD Pocket Video Cameras in the hands of the stars and promoted these award winning devices on national TV, I set out to capture the best responses to the question, "What's your favorite Kodak Moment?" ScanMyPhotos.com and its parent company, 30 Minute Photos Etc. have relaunched an updated Retail Photo Experience Center in Orange County, Calif. to showcase all the latest digital imaging and photo printing and photo gifting products. This new, retail environment is enticing and very hand-on. It serves as a showcase and center of innovation for how ScanMyPhotos.com and 30 Minute Photos Etc. creates new consumer expectations and helps distract from the economic troubles, by providing a fun and new way to involve the whole family with new, do-it-yourself hobby photo project s.
The ScanMyPhotos.com Retail Photo Experience Center is powered by KODAK technology with an updated look at the photo business. It is fully do-it-yourself (DIY), interactive and a fun, new way to think about taking and sharing pictures. A large staff is also on hand to provide training and advice. The Retail Photo Experience Center features in-store KODAK kiosk do-it-yourself service and is linked to a new KODAK AP EX printer system. It is more powerful and economical; customer prices are much lower -the entire photo experience is better, more streamlined, neater and fun. The new Retail Photo Experience Center is designed to create word-of-mouth marketing buzz and enhance customer loyalty by engaging the customer. It is all about making digital photography fun and easy to understand. Technology today makes that happen. Visitors instantly see more than 20 new products on the KODAK photo kiosks and a very inviting and relaxed place to work on their pictures. While they wait, more than 1,000 photos are scanned in about fifteen-minutes, then the magic begins. Guests at 30 Minute Photos Etc. and ScanMyPhotos.com can then restore and enhance each picture, zoom, crop and change every pictures on the KODAK kiosks. Photography has been redefined by integrating a new way to make photographic pictures and 100s of other custom photo products. It leverages proven KODAK technology to maximize the customer experience and is efficient and eco-friendly. The new printing solutions are showcased at 30 Minute Photos Etc. and ScanMyPhotos.com at their retail photo center in Irvine (Southern California). "The new Retail Experience Photo Center showcases an ongoing commitment by 30 Minute Photos Etc. and ScanMyPhotos.com to deliver the best KODAK technology and new high-speed innovations to create an enjoyable and fun experience for consumers to do more with their pictures," said company president and CEO, Mitch Goldstone. All products are instant and presented to the customer, all completed and ready for sharing within minutes. inclu ding instant KODAK Perfect Touch photo products, photo books, KODAK Picture Movie DVDs, prints from your camera phone, giant collage posters from your favorite snapshots and more. As an environmentally friendly photo center, 30 Minute Photos Etc. and ScanMyPhotos.com invites you to visit today. The new retail environment is energy efficient from the ground up - from modern air conditioning to energy efficient lighting and an array of eco-friendly solutions that helps protect the environment. There is no more chemistry or silver recovery processing units. Bring lots of memory cards, shoeboxes of photo snapshots, a camera phone with saved pictures and your imagination. Then, get ready to have fun and revisit your favorite photo memories and make new ones. Stop by so we can say hello.